One of my items was included in a Treasury on Etsy again! It still gives me the thrill whenever I see a "golden" star while browsing the treasuries. The treasury that featured my item is called White and Red. Like the title, it is a selection of white & red items. 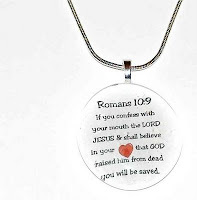 1) Glass Pendant with Scripture / Saying by ImJewelee - I love to put my favorite bible phrases in a glass pendant! It would be a perfect gift for birthdays or baptism! 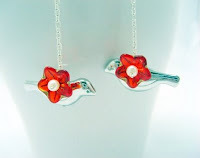 2) Petite Cherry Blossom Birds - This is the last piece of these gorgeous earrings! Love the striking red against the silver birds. I love red!! One of my favorite colors. You have a wonderful treasury!